I've been seeing other miniature blogs posting their favorite influences. I don't know who started it, but the ones I remember were on the http://theangrylurker.blogspot.com and http://bigleesminipaintingblog.blogspot.com/2012/01/blma-playing-favorites.html. Wargames Period: I like them all and have minis for ancients, medieval, Napoleonic, fantasy, sci-fi, modern, and WWI. But my first and favorite would be Medieval. Though I'd like to some day run an Anglo-Zanzibar game. The game turns shouldn't take long as the war only took 40 minutes. Another fun game might be the Moldovan-Transdniestrian War, when after the battles the opposing officers would meet up and drink the night away. I wish we still fought like that. Scale: 25-28mm. Smaller looks like painting would not be fun. Larger models and you might not be able to convince the wife you're not just playing with toys. 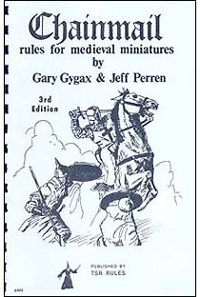 Rules: Chainmail Rules for Medieval Miniatures, published by Guidon Games and later TSR. The rules were simple and fun, despite a few gaps and contradictory areas. There's even a section at the back for fantasy miniatures which was the father of D&D. Manufacturer: Perry Brothers. Great sculpts, cheap plastics, compatible with many other companies. Metal, Plastic, or Resin: Metal. Resin is poisonous, metal will last longer than me, and I'm scared all my plastic will decompose before I die. Opponent: Whoever is across the table. Film: I really like the Bernard Cornwell tv show based on the Sharpe novels. My favorite movies though are Kafka, Bladerunner, Where Eagles Dare, and of course the best war film ever made "Kelly's Heroes"
Book: Really it's books by Bernard Cornwell. As a kid I loved Tolkien or any Tolkien rip off. Art: Some of those ancient Rogue Trader artists, Angus McBride, Perry Brothers. Web: I check these three almost daily: TMP, the Lead Adventure Forum and http://wabcorner.blogspot.com/. interesting, I'm also a Cornwell fan, my favorite fictional characters are Uhtred, Sharpe and Thomas of Hookton, in that order.